At last — an authentic photo of a giant skeleton discovered by archaeologists? 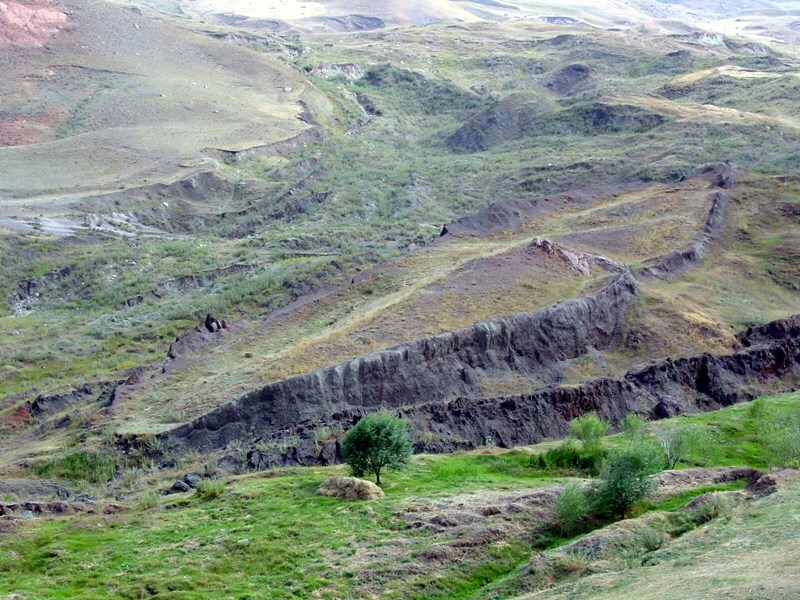 As readers here will already know, you can pretty much assume that any photo showing a giant skeleton unearthed at an archaeology dig is faked. I ran across this photo at an article on Liberty Voice called “Giant Human Skeletons Discovered in Wisconsin?” Liberty Voice‘s tagline is “Boldly Inclusive,” and I would venture to describe it as a little too bold and a little too inclusive. This photo is faked. Note how the shadow of the archaeologist is cast to the left, while the shadow of the skeleton is cast in a different direction. A few years ago, I ran an article here called “Have Archaeologists Found Skeletons of Biblical Giants in Greece?,” which has proven very popular with readers. That article showed that some of the best-known photos of giant skeletons at archaeological digs have been “photoshopped.” That doesn’t mean that giants never existed, but it does caution all of us to avoid being gullible. It seems that the majority of people just do not believe in this type of thing, because it sounds like complete nonsense. 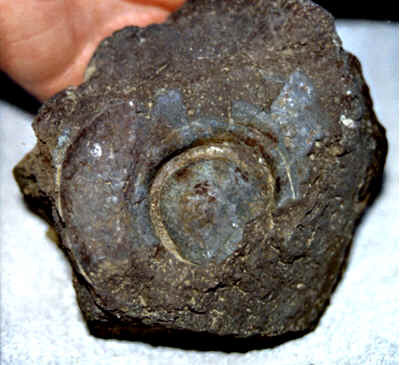 However photographs have been taken to record the finds as the picture with this article shows. One reason it sounds like nonsense is because people keep reproducing these same faked photos. If you’re wondering how I know that this photo is faked, take a look at the shadow cast by the archaeologist in the original photo. Then look at the shadow cast by the skeleton in the section that was pasted in to create a phony scene. The shadows are cast in nearly opposite directions. Lately I’ve been writing about the authenticity of the Bible book of Genesis as an historical source. 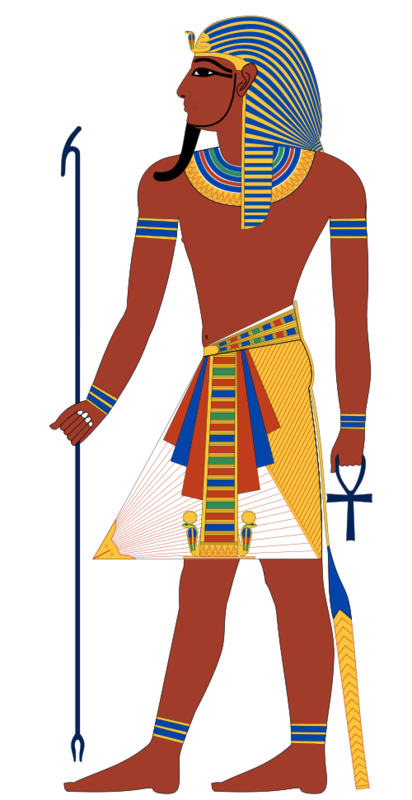 (See “When Did Moses (or Somebody) Write Genesis?“) Many people who consider themselves educated like to sniff that the chronology of ancient Egypt goes back before the Genesis dating of the great deluge at 2370 BCE. Therefore, they claim, Genesis must be fiction. However, a more in-depth examination of the conventional chronology of Egypt reveals that it rests on fragmentary evidence. In fact, the uncertainties around the conventional Egyptian chronology illustrate the problems that exist in reconstructing the human past in general. Even when full use has been made of the king-lists and of such subsidiary sources as have survived, the indispensable dynastic framework of Egyptian history shows lamentable gaps and many a doubtful attribution. If this be true of the skeleton, how much more is it of the flesh and blood with which we could wish it covered. Historical inscriptions of any considerable length are as rare as the isolated islets in an imperfectly charted ocean. The importance of many of the kings can be guessed at merely from the number of stelae or scarabs that bear their names. It must never be forgotten that we are dealing with a civilization thousands of years old and one of which only tiny remnants have survived. What is proudly advertised as Egyptian history is merely a collection of rags and tatters. The evidence preserved to us by the passage of time constitutes but a small fraction of that which must once have existed. Each imported vessel from Egypt represents scores of others that have perished… The amount of information that can be extracted from such occasional articles as the scraps of harness from the tomb of Amenhotep II or the dog collar of Mahirper indicates how much has been lost. History is in important and valuable area of study, but the reality is that history and chronology are often tentative and based on fragmentary evidence, regardless of the assertions of those who claim to have the official version of the truth. Did a Race of Giants Live Among the American Mound-Builders? Artist Marcia K. Moore has created some startling (but speculative) images, based on accounts about North American prehistoric giants. A long-time interest in giants within human culture. A fascination with what I call anomalistics. A particular interest in giants among adherents of Bible-based religions, due to the connection with the Genesis account of the Nephilim (see Genesis 6:1-4), a population of “mighty ones” who lived before the global deluge. Among materialistic contrarians, a compulsion to contradict anomalistic and supernatural claims, particularly those that might lend credence to the Bible. One of the outstanding and un-Indian traits present among the Adena people is their prominent and often bilateral chins…One of the skulls from the Dover Mound, Burial 25…represents a bilateral chin with a width of 52 mm. But where are the physical remains? 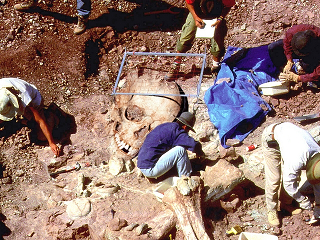 Doctored photo purporting to show archaeologists discovering skeletons of giants. Perhaps the biggest problem with the investigations of the North American giants is the lack of physical remains available for study, at least today. Some researchers explain this paucity of remains with a claim that they were repatriated under the 1990 Native American Graves Protection and Repatriation Act (NAGPRA). I would add that cultural and natural processes also work against the preservation of human remains. Human bones buried underground usually don’t last very long unless they are intentionally protected somehow. This is particularly so in moist climates. Recoverable remains are inherently rare. Anomalistic claims and investigations tend to bring out extreme reactions. Some people are willing to believe almost any extraordinary claim. 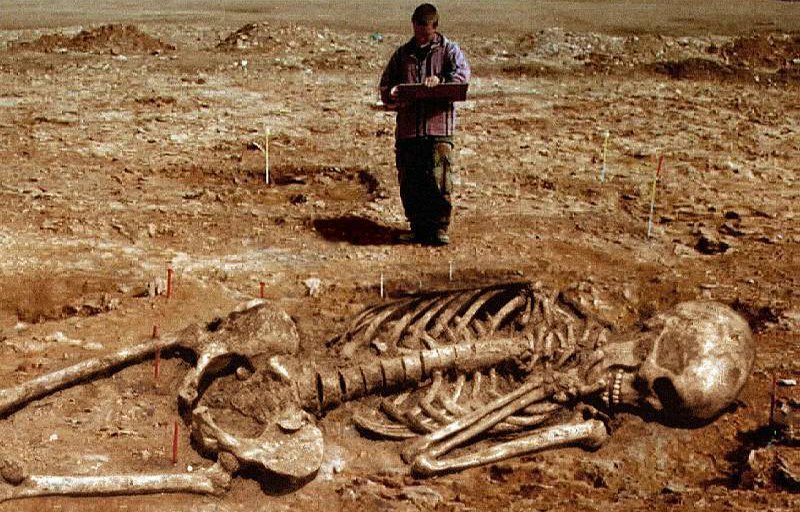 As an example, take a look at the many comments submitted to my article, “Have Archaeologists Found Skeletons of Biblical Giants in Greece?,” in which I showed that some of the popular photos of giant skeletons have been faked. Even so, many readers persist in believing that the photos are authentic. At the other extreme are people who are quick to deny any anomalistic claim. The same article about giant skeletons also attracted some nasty trollish comments from “skeptics” who disparaged anyone who would take seriously the Bible’s accounts about giants. Is a seven-foot giant really such a big deal? 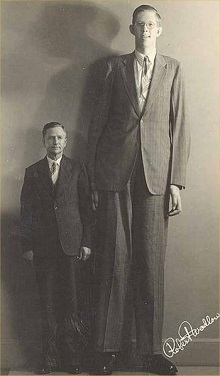 Robert Pershing Wadlow (1918-1940) suffered from a hormonal disorder and grew to nearly nine feet tall. via Wikimedia. In reality, the claim that the prehistoric peoples of North American included a race of oversized humans doesn’t seem that extraordinary. For the most part, the newspaper and scholarly accounts describe remains between six and eight feet in height. This is well within the known human range. What’s called gigantism today is generally seen as a rare hormonal disorder, but it does show that a large human frame is physically possible. There’s no reason to think that extraordinary size couldn’t be passed along genetically and appear within a clan or even a wider population. In fact, this appears to have been the case among some Canaanite groups mentioned in the Bible — see the accounts about the Rephaim at 1 Samuel 17:4-7, 2 Samuel 21:16-22, and 1 Chronicles 20:4-8. It sounds to me as if enough written accounts exist to suggest that a race of giants could have lived among the ancient inhabitants of North America. It’s certainly worth investigating further, but it’s sure to be controversial. That’s the nature of anomalistics. Proto-Elamite statuette of a “horned deity.” Credit: Camocon, via Wikimedia Commons. How did today’s culture develop its images of the Nephilim (called “Sunder” in my fiction series The Cursed Ground), that is, the race of super-human “mighty ones” referred to in the Bible account at Genesis 6:4? Some Bible accounts, such as the King James Version, call these creatures “giants.” In my stories, they appear as giants, but only in the sense of larger-than-normal hybrid offspring of angelic “sages” with human women. Echoes of these characters appear in human stories and legends, particularly in Greek myths, which often feature giant half-gods with violent natures. I’m interested in these mythological images, especially as they relate to the historical-fiction tales I’m writing. One such image came to my attention during a recent tour at the Metropolitan Museum of Art in New York City. The tour guide for Oasis Group Tours stopped briefly at a small statuette in the Met’s “Gallery 402 – The Rise of Civilization: The Ancient Near East ca. 8000–3000 B.C.” The statuette he showed us is similar to the one pictured here, but I’m not sure whether it is actually the same figurine. The Met’s profile of this exhibit calls it a “Striding figure with ibex horns, a raptor skin draped around the shoulders, and upturned boots.” The Met identifies the figurine as Proto-Elamite, and the detail that our tour guide pointed out is that the copper-alloy sculpture is dated to about 3000 BCE. If the museum’s dating of this object is correct, he said, that would place it before the time of the great deluge of Noah’s day, which occurred in 2370 BCE, according to the Bible’s internal chronology. This solid-cast sculpture is one of a pair of nearly identical images of a hero or a demon wearing the upturned boots associated with highland regions, his power enhanced by the mighty horns of the ibex on his head and the body and wings of a bird of prey draped around his shoulders. Nephilim: Good Guys, Bad Guys? Humans, Something Else? 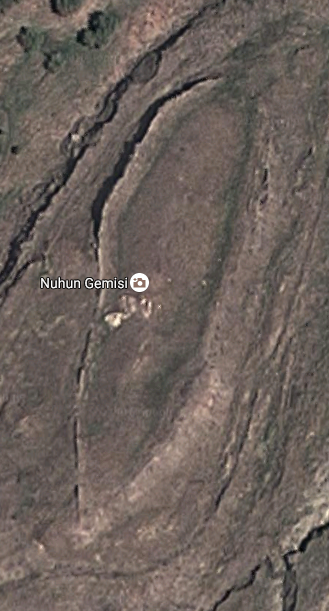 In Search of Manu: Is the Name of Noah Widely Preserved in Human Languages? I’m proud to let readers know that the first two books in my historical series The Cursed Ground have been approved by Awesome Indies and listed on their site. Awesome Indies is a volunteer organization dedicated to reviewing and evaluating the works of independent authors. Awesome Indies Approved (AIA) books are “independently published books that meet, or improve on, the standard of books published by major mainstream publishers and their imprints,” according to the organization. The first two books of The Cursed Ground, The Child-Stealers and Children of the Keeper are now both available on Kindle eBooks. I’m currently working on Book 3 of the series, The Safeguard, which I expect to release in September 2015. I’m very happy to let readers know that Children of the Keeper, Book 2 of my historical fiction saga, The Cursed Ground, was released today on Amazon Kindle eBooks. 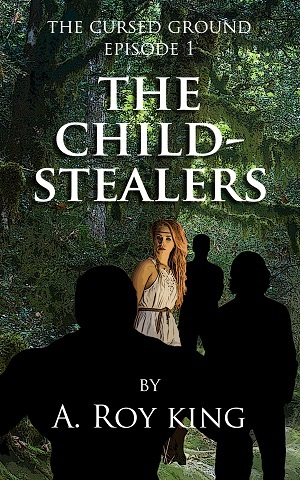 This new book follows Book 1 in the series, The Child-Stealers. I’ve written Children of the Keeper as a standalone story, and I’m told that it reads quite well that way. Temper and her brother, Victor, serve as captains on the Keeper’s Guard, the rough-and-tumble security squad that patrols the city ruled by her grandfather, the Keeper of Wit. Today just isn’t her day. As soon as she comes on duty, Temper chases a thief through the filthy alleys of the city, only to fall on her face in the mud as the criminal escapes. Then somebody pelts her with sheep’s dung at the marketplace. And on top of that, she has to confront a band of hecklers harassing a harmless troupe of entertainers in the city center. Maybe such struggles are to be expected among the unruly Borne, a rebellious race long ostracized from the rest of the human family. But darker conflicts are stirring in the city of Wit. Power-hungry conspirators are plotting to wrest the city away from the family of the Keeper, goaded on by his ancient enemy, the Plainspeaker. As if that weren’t enough, Temper and her fellow patrollers discover that outsiders from the enemy race of the Put have entered the city and are promoting their religion: The ancient fellowship known as Friends of the Becomer. And, surprisingly, some of the Borne are listening to these foreign fanatics. Temper is an expert at chasing criminals, at stick-fighting, and at breaking heads, but place too many conflicts in front of a hothead like her, and trouble is bound to erupt. “The Cursed Ground” historical-fantasy saga brings to life a long-gone era when humans lived for hundreds of years and all spoke the same language. This series tells the story of a group of defenders who struggle to protect their communities from the growing violence in the world around them. Meanwhile, a small brotherhood is charged with carrying an unpopular message to humankind: The Creator has declared that this violent world will soon come to an end. 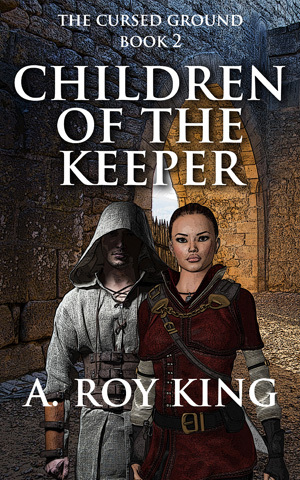 Children of the Keeper is available for $1.99 on Amazon’s Kindle eBook store.